If you burn a lot of firewood then a log splitter can be an indispensable tool that saves you time, money, and a lot of hard work. They operate with a hydraulic ram forcing a log into a wedge thus splitting the wood in 2. In some cases you can find 4 way wedges or dual wedges which can save you from having to make multiple passes. That amount of force is rated in tons and is the main spec to look for. There are two main types of log splitter machines – gas powered and electric. Gas powered models are more expensive, but they are also more powerful, have more tonnage – ranging from about 10-50 tons, and typically have larger frames that can be towed. All that means you can handle larger rounds both in diameter and length in addition to harder woods. Electric units are cheaper, but they typically only have between 4-10 tons of force which limits the size of rounds you can use and is better for softwoods. Besides tonnage some other things to consider include the cycle time – how long it takes for the ram to move all the way forward and then all the way back, engine and motor size, horizontal and vertical operation capabilities, and the warranty. 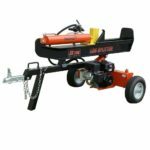 We reviewed dozens of models to come up with our list of the best gas powered log splitters and the best electric log splitters which you will find below. We also have a spec comparison chart near the bottom of this article. If you want more information on the hardness rating of different woods and what force is needed to split them see our tree hardness ratings and log splitter guidelines. With the most force and torque, we rated the Champion Power Equipment 100425 as the best gas log splitter. By far the most expensive log splitter on our list at $1500, the 100425 outperforms any other model thanks to 34 tons of force and a 338 cc engine that generated 15.4 ft lbs of torque. The hardest, gnarliest wood up to 24 inches long is no match for this machine and its 7-inch wedge. The cycle time is a bit slower than some models at 16 seconds, but that still equals 225 cycles per hour. Other features include horizontal and vertical splitting, integrated log cradle, 2-inch ball hitch for towing, 16-inch tires, and jack stands. Overall the Champion Power Equipment 100425 is a beast and we highly recommend for anyone who has a lot of tough splitting jobs to do. The only real downside is the price. 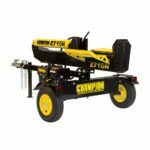 Our choice for the best gas log splitter under $1000 is the $999 Champion Power Equipment 100424. This 434 pound model is the best selling log splitter on Home Depot. Featuring a 224cc OEM engine with 9.96 ft lbs of torque, it slices through wood 24 inches long by 36 inches around with 27 tons of force. It converts from horizontal to vertical in seconds and also has a quick cycle time of just 11 seconds. It comes with 16 inch DOT approved tires and is tow-able. 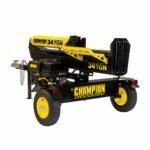 If $1000 is your spending limit for this type of machine, then look no further – the Champion Power Equipment 100424 is for you. Comparable in performance to the Champion 100424 is the $1078 Dirty Hand Tools 100408 gas log splitter. This version features a Kohler 6.5 HP 196cc engine that provides 27 tons of splitting force and 9.1 ft lbs of torque. This allows it to split logs up to 25 inches long and over 36 inches around. It has a 14 second cycle time. The 100408 is the heaviest model on our list at 644 pounds, but it can be towed to get into position. It is well built overall and we would not hesitate to recommend it. The Dirty Hand Tools 100171 at $950 is one of the best values you can get as far as price vs performance goes. Users overwhelmingly love this unit with not even a single negative review on HomeDepot.com or Amazon. This thing is rigid and sturdy at 634 pounds, but that weight also makes it a bit more difficult to move around. It has a Kohler 196 cc engine with 9.1 ft-lbs of torque and 22 tons of splitting force. The very short 10.9 second cycle time will probably be quicker than your pace to keep up. Overall the performance is outstanding, although it can get a bit bogged down by very large pieces of hard wood. We highly recommend the Dirty Hand Tools 100171 for any home user. The cheapest gas log splitter to make our list is the $899 Powermate PLS20825. 25 tons of splitting force are generated thanks to a 208cc OEM engine. It can split logs 26 inches long and 30 inches around with a cycle time of 17 seconds. 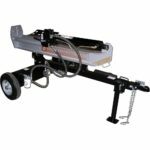 Other features include a 2 inch hitch and 16 inch pneumatic wheels which makes it tow-able, 8-inch tall wedge, and horizontal or vertical splitting positions. For those of you looking for a cheap gas log splitter then the Powermate PLS20825 is a good choice for you. We found the Southland Outdoor Power Equipment SLS20825 on sale $999 at HomeDepot.com while normally costing around $1200. It has nearly the same specs as the Powermate PLS20825, so even with it being on sale it costs about $100 more. The SLS20825 is pretty well built and performs well, but since this 25 ton unit is very similar to the the PLS20825 while costing more we don’t really recommend it. We selected the Boss Industrial ED10T20 as the best electric log splitter. The performance is superior to other electric models, but it is by far the most expensive electric model on our list as well. At around $900 it is as expensive as some much more powerful gas powered wood splitters. It is powered by a 20 amp motor that produces 10 tons of force and can handle logs up to 20.5 inches long and 12 inches around according to specs, but we found it can handle much larger rounds – even 24 inches – when dealing with seasoned softer woods. The wedge moves and splits in both directions so it does not need to return in between cycles. At 214 pounds the ED10T20 is a bit heavy to move around, but that mass makes the platform more sturdy when in use. The built in stand and log racks also keeps everything off the ground so you don’t have to bend over constantly. Overall the Boss Industrial ED10T20 is for someone who absolutely wants an electric log splitter, not gas, that can handle most splitting jobs and doesn’t mind paying for it. Just be aware that it can still have difficulty with large rounds of hard wood or green timber. Another popular, but less powerful Boss Industrial log splitter is the Boss Industrial ES7T20 which sells for $450. The main difference with this unit is the 7 tons of splitting force and the fact that it only has one wedge, so it does not have the bi-directional splitting ability. It also sits lower on the ground, unless you prop it up somehow. This 128 pound machine has a 14 second cycle time with automatic return. It is capable of handling logs up to 20.5 inches long and over 10 inches around. We would recommend the Boss Industrial ES7T20 for any home user with small to medium sized jobs and doesn’t want to pay nearly double for the ED10T20 or for a gas powered model. Another popular 7-ton model is the $508 Powerhouse XM-380. It requires a 20 amp 120v circuit for the 3 HP electric motor that generates 7 tons of splitting force which the manufacturer says can handle logs up to 20.5″ long and 12″ in diameter. It also has a 15 second cycle time. On the downside some of the user reviews on Amazon are not quite as good as the top rated models with a 3.9 star average out of 5. Some users have complained about the construction quality and parts failing prematurely, so buyer beware. However, reviews on some other websites are more positive and many users also really like the 104 pound Powerhouse XM-380. With a price of just under $250 the Southland Outdoor Power Equipment SELS60 splitter is a good value for the price. Powered by a 15 amp electric motor with 1.75 HP, it generates 6 tons of force which can split logs up to 20.5 inches long and 10 inches around. It has a cycle time of 18 seconds. One nice feature is a vertical storing option which saves space when in storage. Overall the SELS60 is a good choice for home users on a budget. The cheapest log splitter on our list at the time of writing is the WEN 56207 at right around $245. This 98 pound machine has a 2.5 HP electric motor that can generate 6.5 tons of force and can handle logs up to 10 inches in diameter and 20.5 inches long. It has a long cycle time of 20 seconds, but it does come with a stand so you can elevate the machine so you don’t have to work on the ground. If price is your biggest concern, then the WEN 56207 is perfect for you. It is pretty comparable performance wise to other models in this price range and comes with a stand. 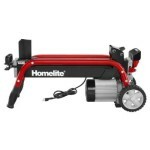 Available for $259, the Homelite UT49103 is the best selling electric wood splitter on HomeDepot.com with an average rating of 4.6. This 5-ton model can handle soft wood logs up to 20.5″ long and 10″ in diameter, but cannot handle that size in hardwoods. This cycle time is longer than we would prefer at 20 seconds, but overall this unit is pretty well built. 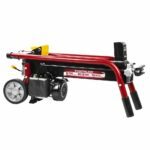 Since it really struggles with hardwoods, we only really recommend it if you are going to be splitting soft woods of a small diameter – it is a good machine for that purpose and the affordable price makes it a good buy. Here are some of the most common types of trees and their Janka hardness ratings which is a way to determine how hard a wood is. In the table below we tried to estimate what the minimum tonnage it would take to split various types of wood based on their Janka hardness. Besides the diameter and length of the round, there are many other factors that affect how easily firewood will split including how dry it is, the grain, and knots. Therefore this table is not perfect, but should give you a good approximation of what each model is capable of.